Well, what do you know... the first half of the year already passed and we're on our way to the second half. Time flew by so fast! With July here, it's also mark my official start with Avocado Arts. 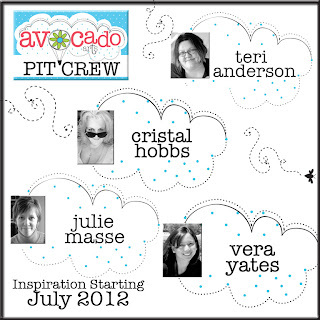 There are 5 of us newbies that joining Avocado Arts Pit Crew (Ashley Harris is the 5th member) and I am so thrilled to be working with the fabulous ladies on this team. Today, I used AA July's set called Bold Celebration. 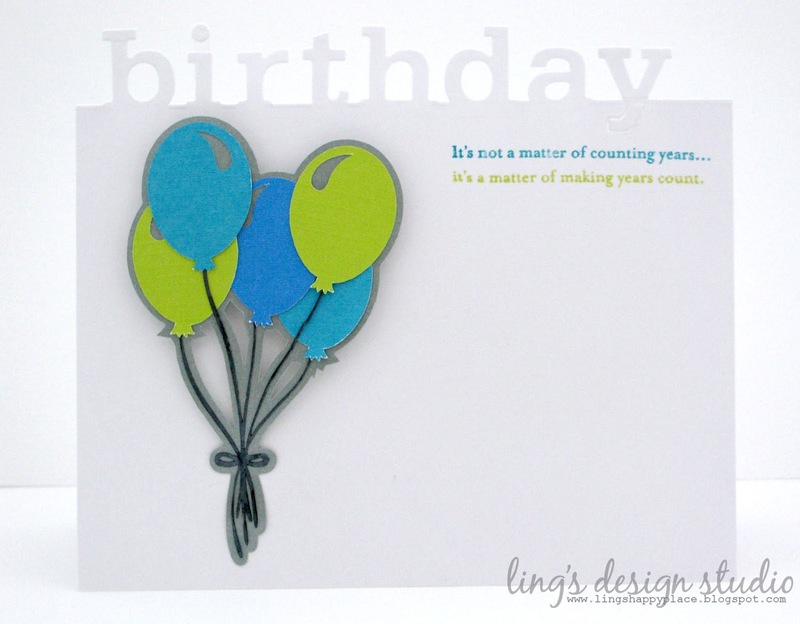 I decided to make a long card and of course, I have to go with bright colors to make this cheerful card. For extra texture, I curled up the end of the banners. Please stop by the AA blog for more inspiration. And don't forget to check out my other teammates' blogs! You are going to love what they share today!!!! Hi everyone. I have a special post today. Recently, my friend and team mate from Lawnscaping challenge, Christy's home was broken into and a lot of their things were stolen and destroyed. What makes our community so remarkable is that we are there for each other even though we can't physically be near our friends. These "people" violated her home, the place where we are supposed to feel the most safe, where we raise our children and where we sleep in peace. Dealing with the police and insurance company has been and continues to be exhausting and frustrating for Christy and her family. Some of us have come together to help and cheer her up. We are of course making cards for her because that's what we do, right? But ultimately, the expense of trying to get her family back on their feet will be somewhat of a strain. Imagine having to replace household items, necessities in our world all while trying to rebuild a sense of security that we all most times take for granted. So, we're asking for your help. We've tried to make it convenient for you to help Christy and her family. There's a PayPal button on each of our blogs. We are asking that if its your hearts desire, that you donate whatever you can to help Christy and her family regain a sense of safety and security. NOTHING is too small. Every little bit will make all the difference. Our goal is to raise $1,000 to help cover the costs of food, lodging and replacing at least some of the items taken. 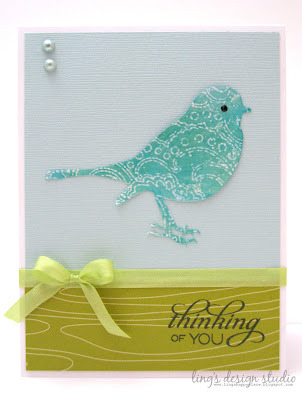 I first stamped and heat embossed a piece of cardstock and then cut the bird using Mister Q. Then covered the bird with glimmer glaze and add the eye using black enamel. The beautiful silk ribbon is from May Arts. If you're interested in seeing all of the cards, a full list of girls who are participating in the card drive is available at the Lawnscaping Challenge blog & A Blog Named Hero". Thank you so much for your visit and thank you for joining us in our effort to help Christy. Have a blessed weekend everyone. My birthday always start a day early as even though it's only the 27th here, it's already the 28th in Indonesia. So, yesterday I already got a bunch of birthday wishes. Then this morning the doggies barking and woke me up at 4am and sweet hubby half asleep sang happy birthday. LOL. 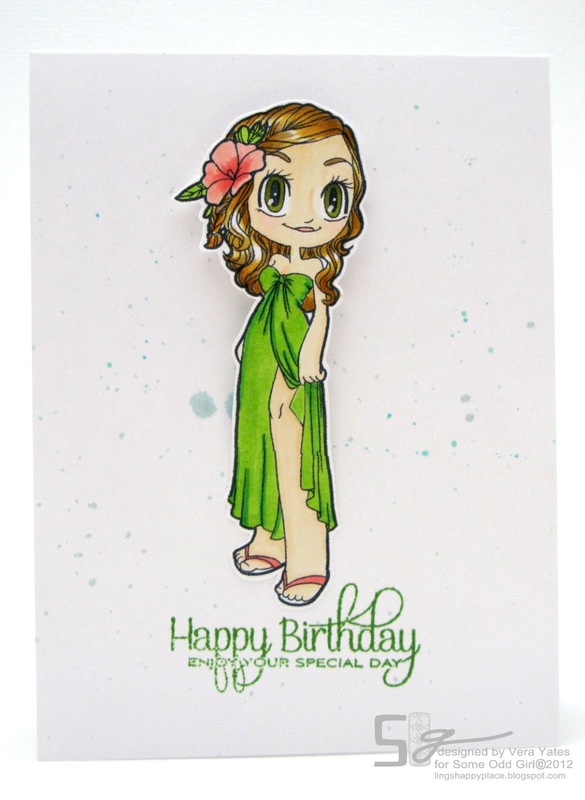 Let's start the celebration with a birthday card, shall we. 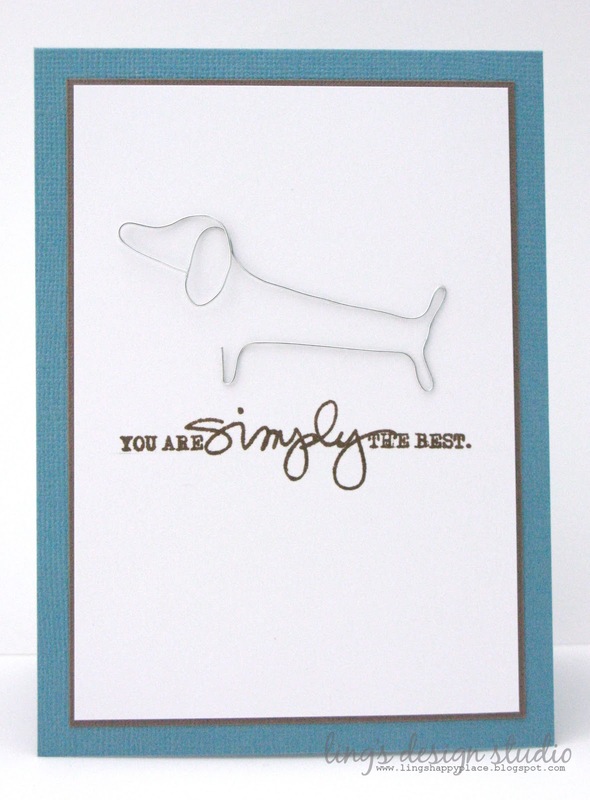 This card was a publication reject, but I still think it's pretty neat. 1. I am most grateful for my mom. Not only she carried me around for 9 months and popped me out (hi Mom), she also shaped me into who I am today. Most influential person in my life. 2. I am thankful for my thoughtful hubby. He'd wake up in the middle of the night to take care of the doggies just so I can continue sleeping. He treats me like a princess and I love him to pieces (oh hey, it's rhyme... hah). 3. I would do anything for my brothers. I adore and admire my brothers tremendously. I look up to them. 4. Every single day I thank God for the greatest blessing of all, a great, loving, close knit family. That our family even as we expand as each kid got married, we all get along so well and we really do like and love each other. 6. I am a softie and a cry baby at heart. 7. I am impatient in general, but I have the patience to fussy cut an intricate image. 8. I keep a list of movies that I watch each year. 9. I could name a movie, even one I haven't seen, just by looking at the actor's outfit or a quick scene. Am a bit obsessed with movie. 10. Going to Greece is on my bucket list. 11. It's my dream that one of this day my card will make it on the cover of a magazine. 12. Currently I love listening to audio book while I am driving or working in my craft room. 13. I love fantasy book like Harry Potter or Fable Heaven. The kid in me just love fairies and magical world. 14. I believe in nurturing the kid inside you. 15. I have learned that when you go through a bad time in your life it's an opportunity for better time in the making. 16. I believe in angels. 17. I shared my birthday with my uncle. 18. In high school I love geography and biology because we did lots of drawing that allowed me to use plenty of colorful pens. 20. I consider myself a practical person. 21. Never fails that each year, I get homesick on my birthday. I miss celebrating my birthday with my family. I am grateful for my life. The good and the bad, both shaped me into the person I am today. I am not taking anything good in my life for granted. I realize how easy things could change. I hope all the people that close to me know that I love them and that I appreciate them. I hope that I continue to be the person that my parents can be proud of. 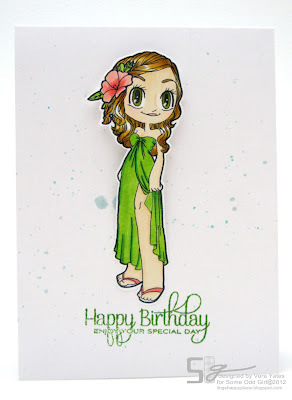 Have you heard about Heroes Card Drive that Laurel Beard has put together over at Lawnscaping? You may or may not be aware that laurel's husband Christian has just left for deployment with the U.S Navy. I get to meet right before his deployment and just like Laurel, he's super nice. She is organizing this card drive to collect cards to send to the men and women that service alongside her husband on their ship. Please click here for all the details! 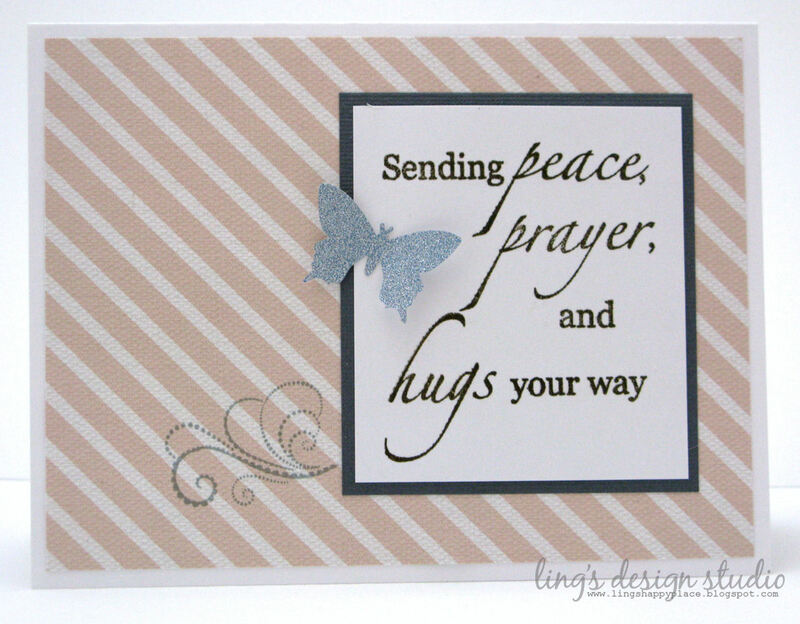 We are looking for quality, handmade cards FOR OUR TROOPS TO SEND to their loved ones. Out on the field, many of our soldiers do not have the opportunity to purchase a card to send for their child's birthday or simply to tell their significant other that they love them and are thinking about them. We want to provide them this service. This weekend was a very productive weekend for me. We're finally getting new kitchen cabinets! Hubby had waited for 9 years for this. :) Through out the whole week, I cleaned out the old kitchen cabinets and we get rid of a lot of stuff. It was quite liberating. And, our old kitchen cabinets didn't go to waste either. One of our vendor took it to use at his place. Love it when things get recycle and go to good use. Now, we're pretty much done with any house project and we can just enjoy it. Today, the plumber and the electrician will come and then I should be able to put everything back. Yay!! 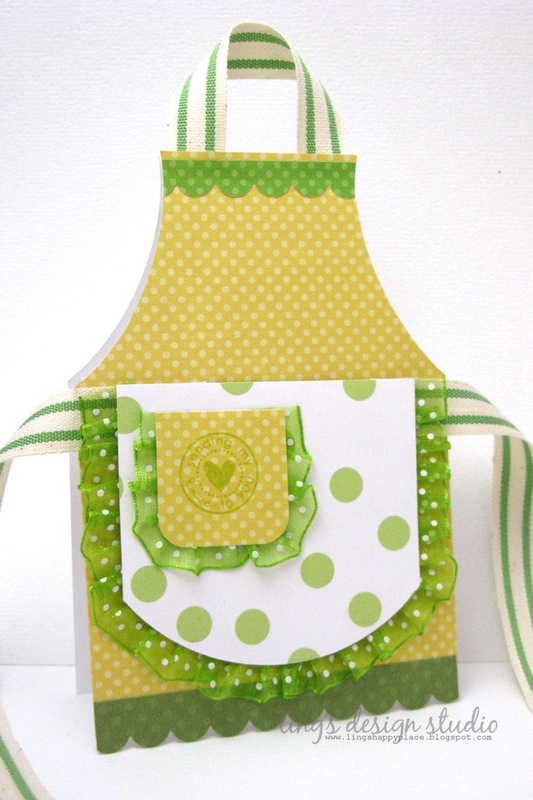 Since we're talking kitchen today, I thought I also share this apron card that I made for Paper Crafter's Library post last month. And below is pic of the card with a gift card inside the front pocket of the apron. Now, I have to brainstorm for birthday present idea. My birthday is coming up in 3 days and hubby been asking what I want for my birthday and I don't have any answer for him. 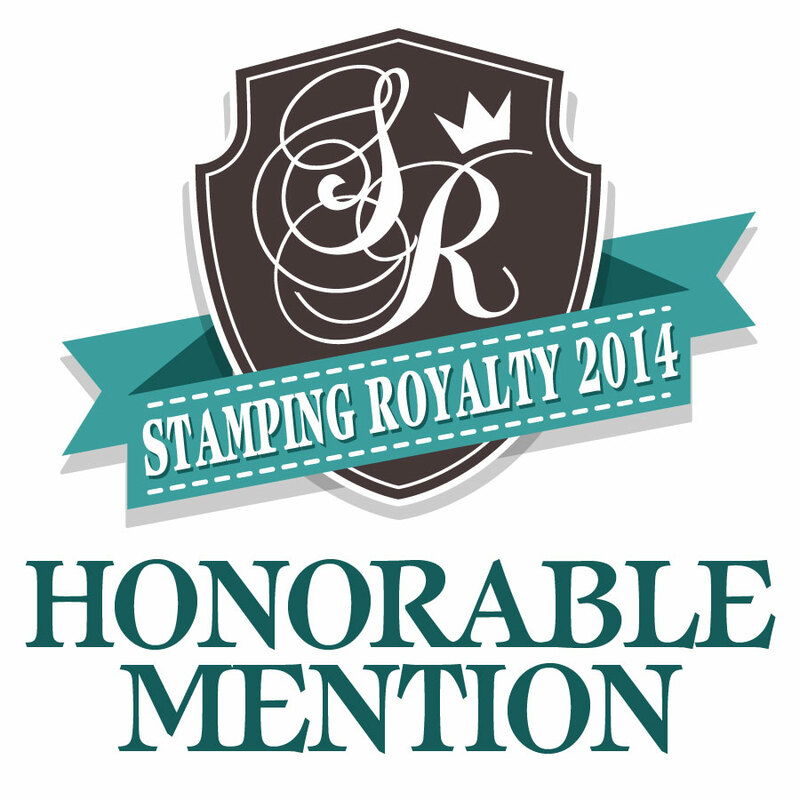 I know, I know a girl can't have too many stamps, but I think he wants to give me something special other than stamps. Every time I get a new shipment of stamps, he always joke, really you need more? LOL, I don't think he realize that I will always have a stamp wish list. Hubby's friends pretty jealous of him because I never ask for jewelry or anything like that. I told him I am way too practical for things like that. I only wear my engagement & wedding ring from him and necklace from my mom, so why would I ask for jewelry if I rarely take off these 3 standard staples? Time to ponder and come up with some list... :) Have a blessed week everyone. Today, I have an exciting crafty news to share. 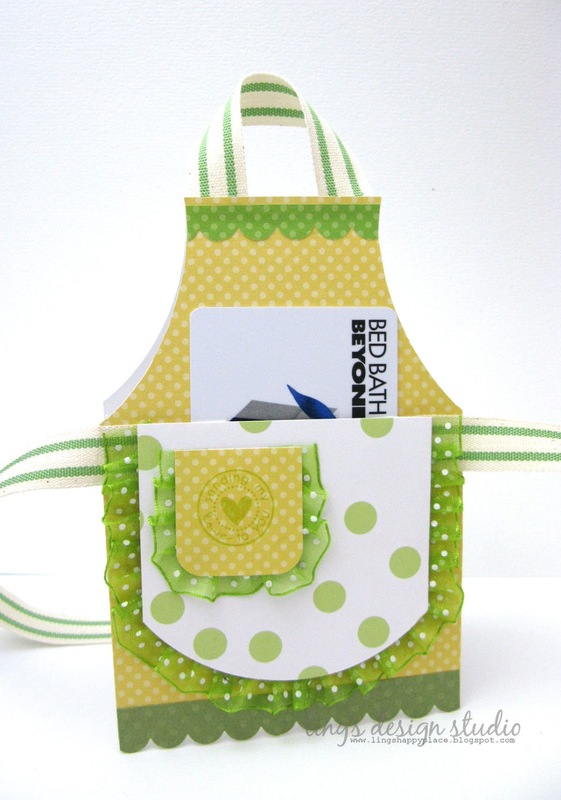 I've been asked and have delightfully accepted to join Becky Oehlers' mini design team. She is joining Gina K Designs as their stamp illustrator. 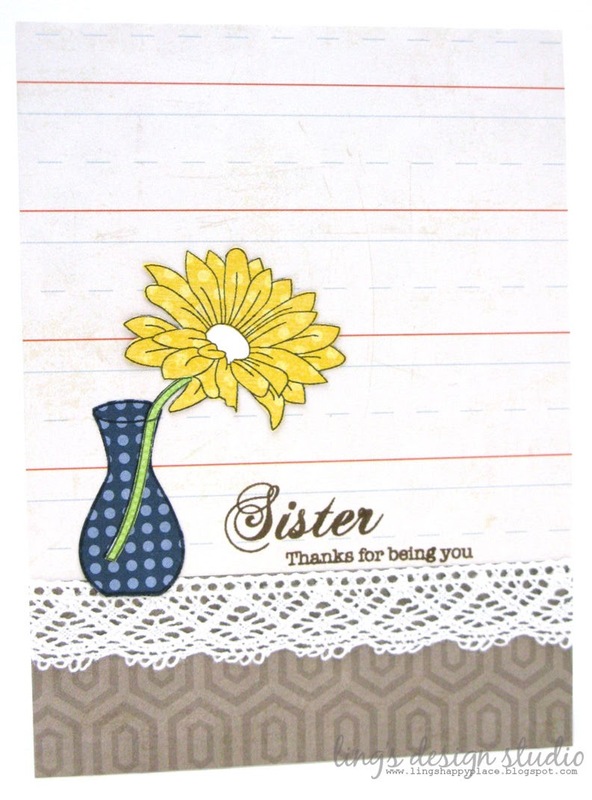 You probably already familiar with her clean design style as she previously she designed some fabulous sets for Papertrey Ink. I met Becky through Avocado Arts (which I am joining as well and my term with them will starts in July) and when she asked me to join her team, I was pleasantly surprised and honored. I will start sharing Becky's design starting in July. 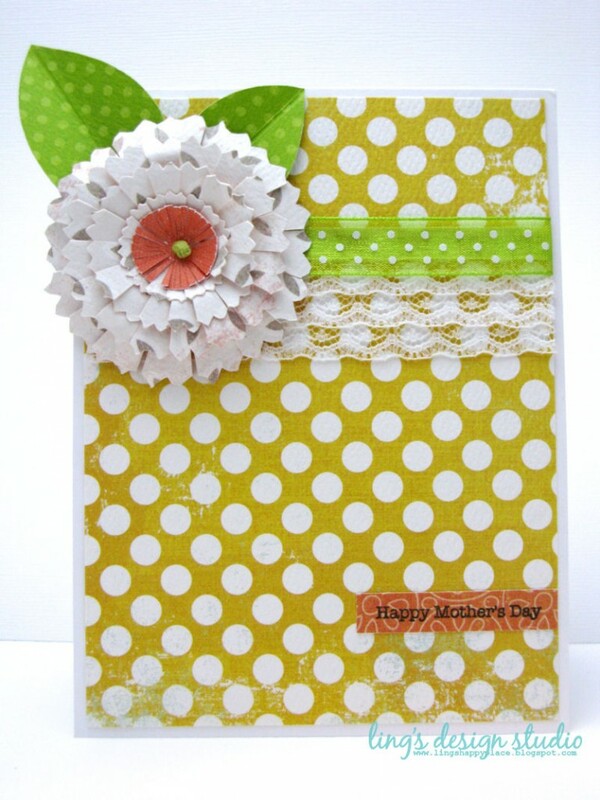 I can tell you that you will love her fabulous clean design style! 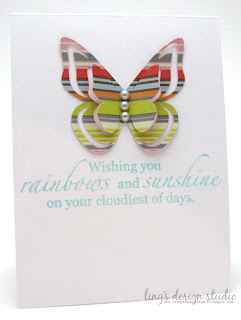 And... if you joined SP & Company June Release blog hop, the winners from the blog hops been announced HERE. Hint.. hint... someone who left a comment from my blog is one of the winner. So, check it out, see if it's you. :) Have a fabulous Friday everyone. 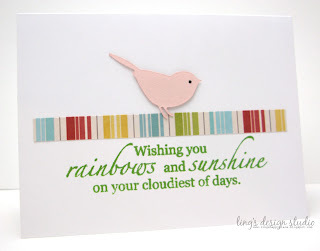 Hi everyone and welcome to May Arts & G45 blog hop. All week long, both teams will be bringing you tons of inspirations. Each day you can hop around to 4-5 blogs and simply by leaving comments, you would be entered for this week giveaway. For a prize detail and for a complete list of the blog hop participants for each day, please go to May Arts or G45 blog. 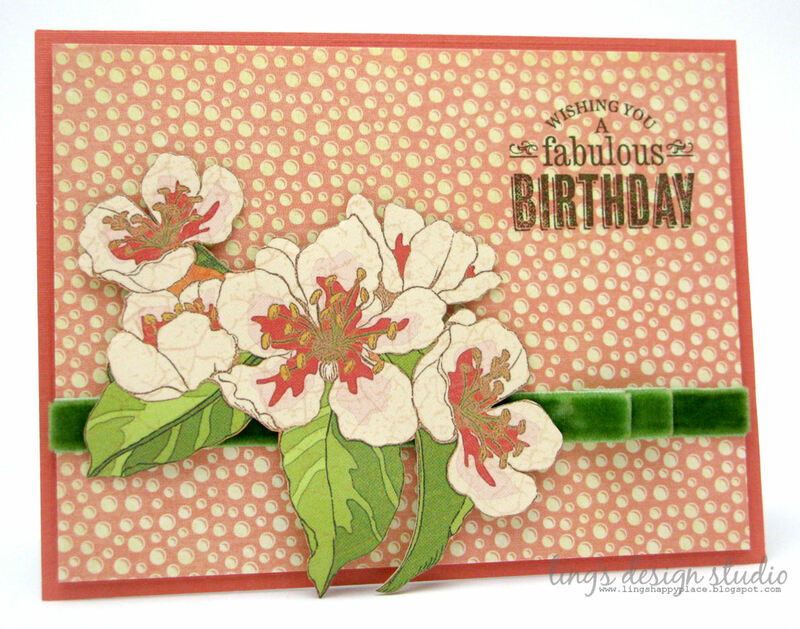 As you might remember, the fist time I used G45 products marked the day I tried on vintage style, which to my surprise lead to an acceptance letter from Paper Crafts for vintage card category (up coming Nov/Dec issue). So, needless to say the vintage style kind of grow on me a bit. This time I get to play with G45 beautiful Tropical Travelogue collection. And I am glad that I can combine the vintage look with my CAS style. Here's a look at my cards. 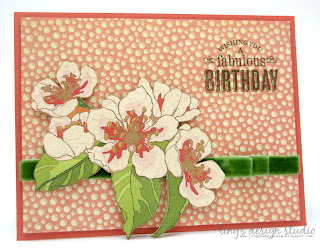 For both cards, I cut out the flowers from the patterned paper. I mean seriously, you could get loads of cards made from this one collection. 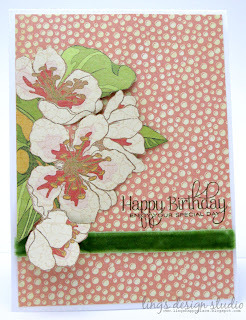 And, depends on how you use them , you can create a simple CAS card or a vintage looking card. Thank you so much for stopping by here. Have a beautiful day! Are you ready for a new Lawnscaping challenge? 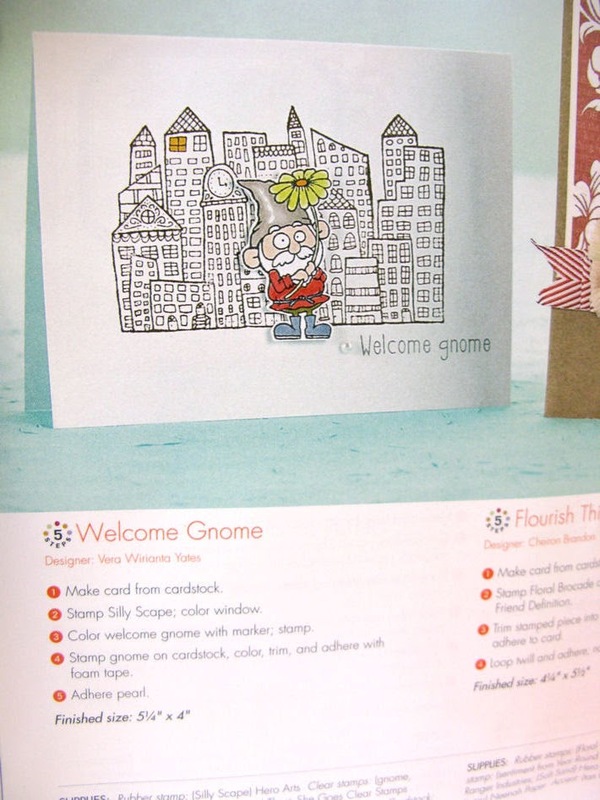 This time the challenge is to create a project with a color splash and we are sponsored by Lawn Fawn. Please check out the DT samples at Lawnscaping. And, in case you missed it, yesterday we just announced the girls that are joining our team. Check it out HERE. Now, random stuff. I love Pinterest. For me, it's a source for lots of cuteness (I pinned lots of cute animals on my Animal World board), inspiration for my future vision board (a girl can always dream to have a house by the lake or on the beach), and a source for many DIY cleaning stuff. As someone that's environmentally conscious I am trying to be more green and try to start making my own stuff. I mean, after all that time pinning stuff, I should at least try them, too right? And, less chemical to use... even better! So far, I have tried to make my own bathroom cleaner. Now, we buy distilled vinegar in a gallon since there's so many use for this. Granted it doesn't smell the best, but vinegar works wonder to clean your mirror. No streak. Mixed it with Dawn liquid and you can clean your shower door from any soap scum. Mixed it with baking soda and rinse it with hot water and you get sparkling clean sink in no time. Then, yesterday I made my first batch of home made laundry softener. I used the recipe from The Frugal Girl HERE. Again, simply by mixing hot water, distilled vinegar and your choice of hair conditioner. Now, instead of the standard fresh laundry smell, our laundry come out smell even better, like my favorite hair conditioner. Have you made anything from the stuff you pin on Pinterest? Please share and if you have more cleaning tips, I'd love to hear it. Have a blessed day everyone! Happy Friday! As always, I love Thursday. The anticipation of weekend is getting close. 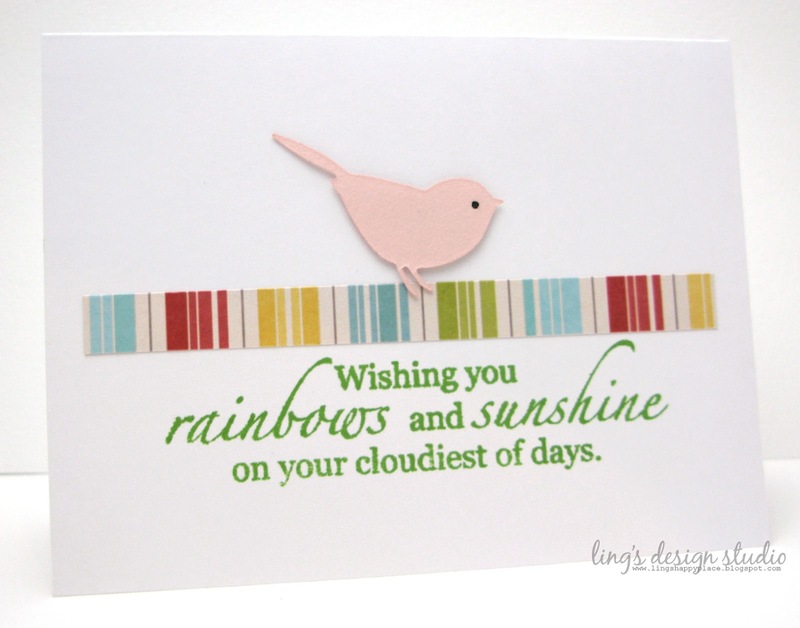 :) And, yesterday was definitely a happy Thursday as I received a happy acceptance email for 4 of my cards. 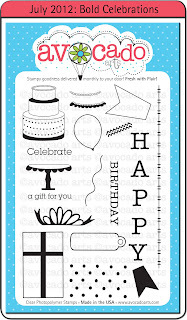 And, I cannot wait for Paper Crafts Stamp It! to come out as I already received the check from that publication, which means the magazine is coming out soon and I have 3 cards in there. This year been a good year. 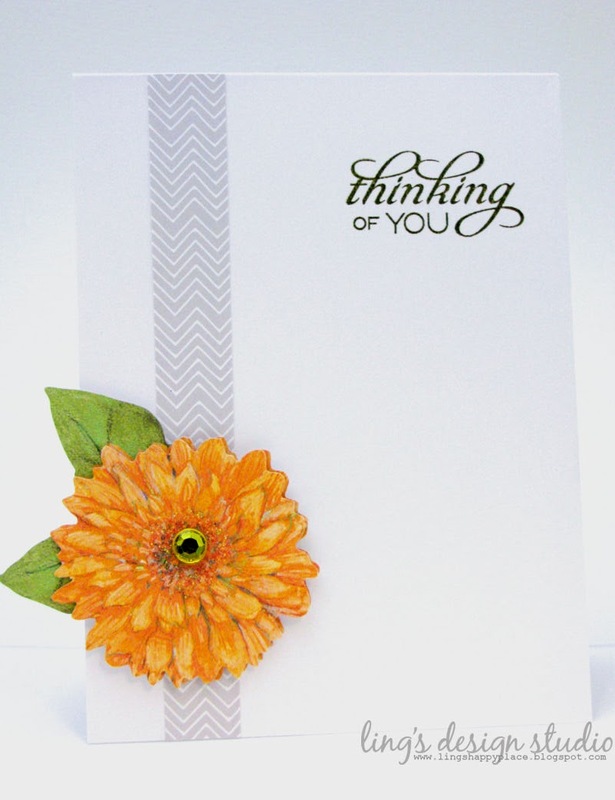 Am working on several DT projects right now, so for today, I'll share my cards that were posted on SP & Company blog, but haven't been posted here. This butterfly one was posted last week. I am really loving super clean & simple design lately. The butterfly was cut using Mister Q (Silhouette). 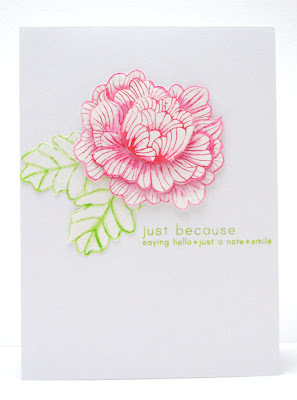 Next is the card that was posted on SP & Company blog yesterday. 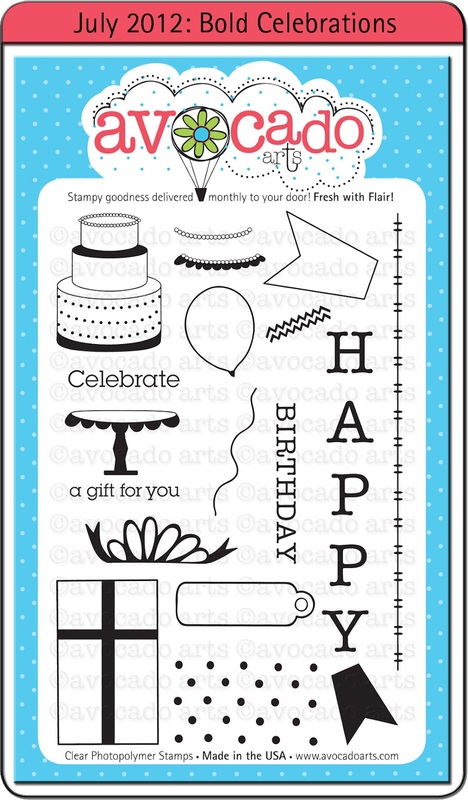 The sentiment stamp is actually a long one line sentiment and I decided to stamp it part at a time to fit it in the rectangle box. That shimmery bottom background was made of clear microbeads. Back in the days, microbeads were quite the trend in scrapbooking. Like around 2003-2004. Yep, I have them stashed since then. Old, old, old stuff. I covered the cardstock strip with doubled sided tape and sprinkled the microbeads on top of it and gently rub in to get them really stick. In person, you could see the fun texture much better. For more inspiration from the DT gals, please check Some Odd Girl blog. I am loving the color green at the moment. I think this green just look so refreshing. And, against the white background it stands out nicely. Everyone, meet Some Odd Girl Cheers Kaylee! 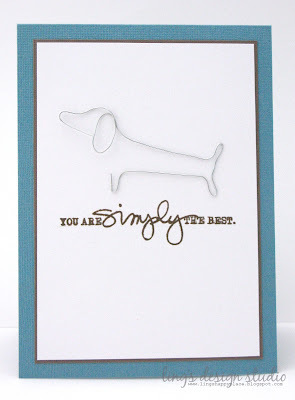 This is one of my favorite SOG card that I ever made. The whole look of the card totally make my heart beat a bit faster. It just looks so clean & chic. And, am pretty tickle with the sunglasses. Phew.... what a week this past one week been for me! Between my puggy being sick and working on submission for private call, it was hectic. I did managed to complete roughly 30 cards. Some for submissions, some for DT works, some for CHA, etc. I actually had 2 weeks to work on the submission part, heh..., but as usual my brain didn't start to have all the neat ideas till it's under pressure or in other words as the deadline approaching fast. Among those card is my card for Some Odd Girl new release week. This week, Some Odd Girl is releasing 4 fabulous & beautiful digis. Today, we're introducing Tropical Mae. The DT girls has created some fabulous sample for you, please check them out at Some Odd Girl blog. 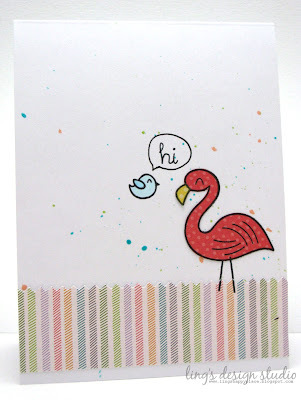 Hi everyone and welcome to SP & Company June Blog Hop. This month's color is Hot Pink! After you're done hopping around today, make sure you play along with this month's Hot Pink challenge (click here for details) for a chance to win some amazing SP and Company prizes! 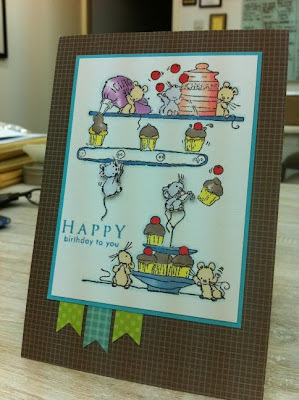 Here's my card for today's hop using the new release Chevron border stamp and the sentiment from Sympathy & Care set. Anyway, don't forget that the random prize patrol is watching so leave a comment on every blog to be eligible for the prizes!! 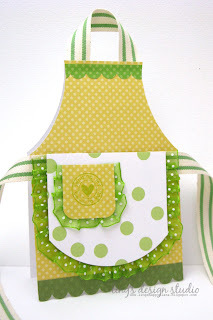 Make sure you pop on over to Chrissie's blog - she has an extra prize to give away! The more blogs you comment on, the better your chances are of winning something fun! 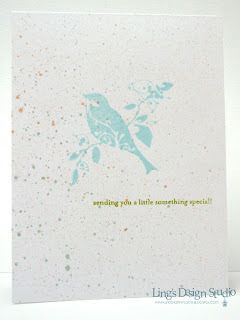 Make sure you check out the SP Blog to see what Samantha did with the new stamps! 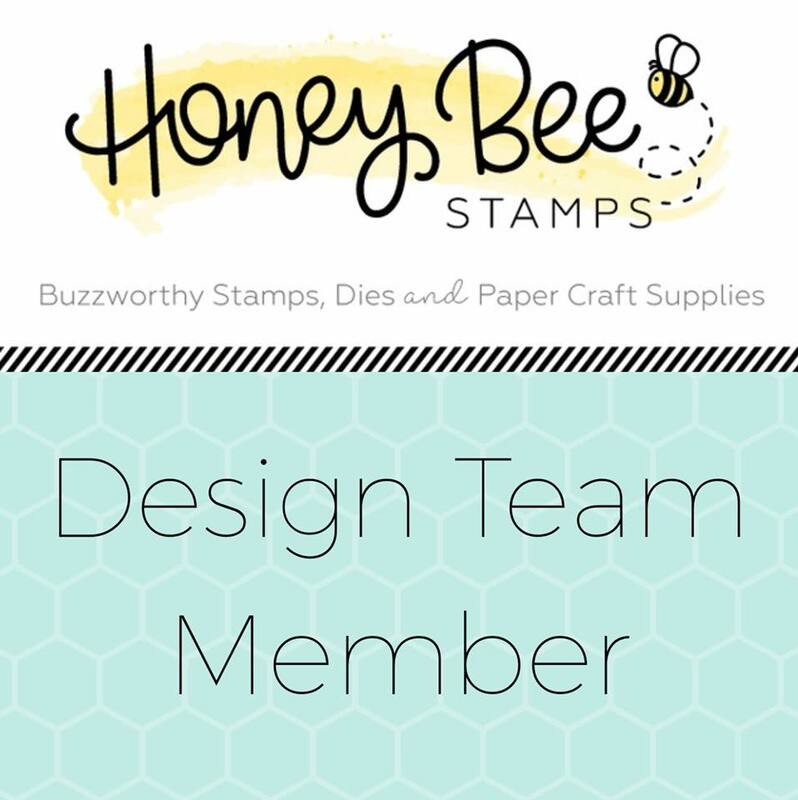 And don't forget to hop around to each Design Team Member's blog - there are brand new projects with the stamps that came out TODAY to inspire you! In our household, the puggies ruled. :) That's just the way it goes. 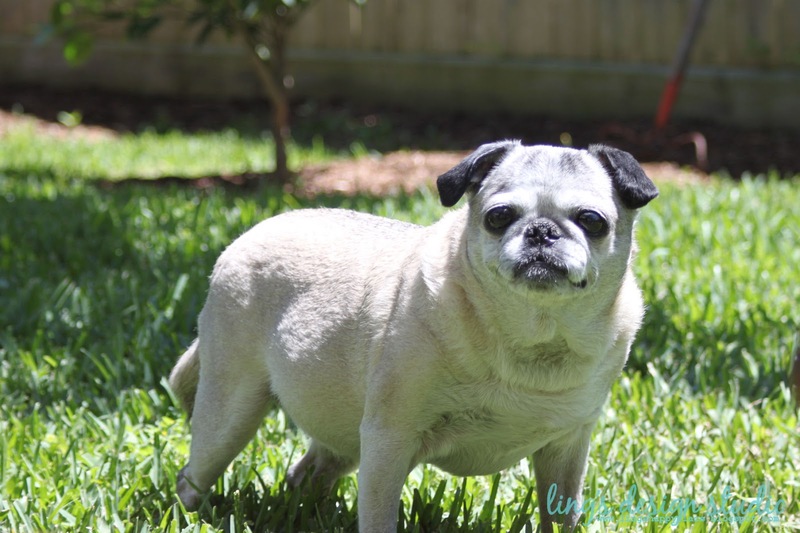 I know, lately I've been showing Eli pics, but today, it's time to share Ollie's pic as she just celebrated her 14th birthday. Ollie is my first baby. I have her since she was only 8 weeks old and she is one feisty, bossy pug, but we love her. This week is not the best week for her, though. She's been coughing non-stop and on Wednesday (which was her birthday) we had to take her in to the vet and they suspected collapsed bronchia, and due to her age, surgery is not an option. So, right now she's under 4 different medications. Needless to say, hubby and I haven't had a good sleep this week. And, I want to thank hubby for being such a great dad to Ollie. Even though he's only been part of Ollie's life for the past 5 years, he loves her so much and really take care of her and spoiling her. She is his buddy. He even share (or more like give up) his man cave with her. 14 is pretty old for dogs and I am grateful to still have her with us. The doctor said her heart is a strong one for her age. To Ollie, happy birthday baby girl, despite causing us lack of sleep, we love you bunches. The dog was inspired by Picasso one line drawing and I freehand shape the dog. 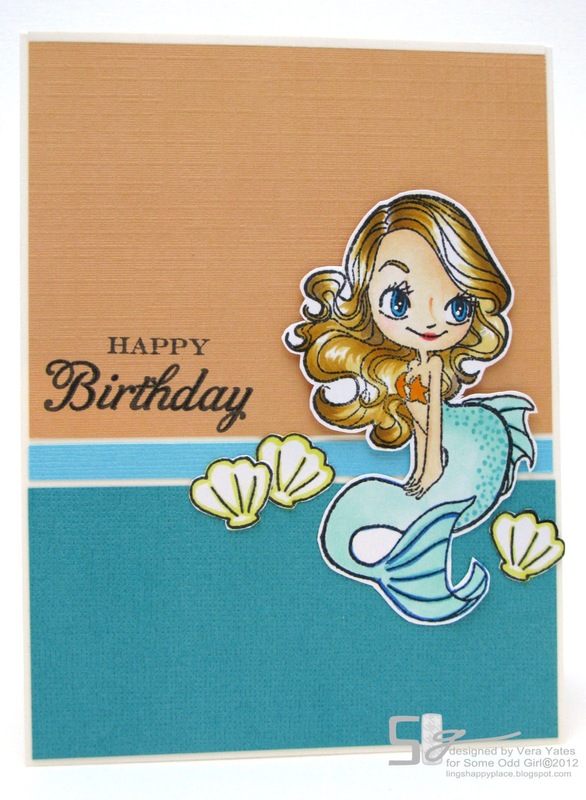 I think beside my fish card, this is one of the card I am most proud of. Shaping wire is tricky, especially when you're like me, where you want the line to be super straight. I tried to make a pug shape and ended up with messed up, crushed wire because I got frustrated. LOL. And, speaking about birthday, my brother finally got my belated birthday card and I just love him for bragging and sharing my card with his followers on twitter (he has tons of followers). My family supports always means the world to me. This is his twitter POST, sharing this pic that he took. Good morning, lovely peeps! And, happy Wednesday. Today, I have a post up on May Arts blog as we are teaming up with Lawn Fawn. You can check out my project HERE and would so appreciate it if you check it out and leave some love. 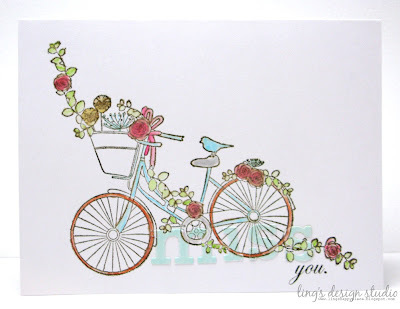 Just for leaving comments, you'll get entered to May Arts & Lawn Fawn giveaway. Then, last week Lori Whitlock emailed me asking if she could highlight my project that I previously made for May Arts on her blog. Of course, I said yes. I love Lori's designs and you know how much I love sharing anything I made using Mister Q (that's my Silhouette in case you wonder who is Mister Q). Here's the card that being highlighted on Lori Whitlock's blog today (originally posted on May Arts blog HERE back in April). 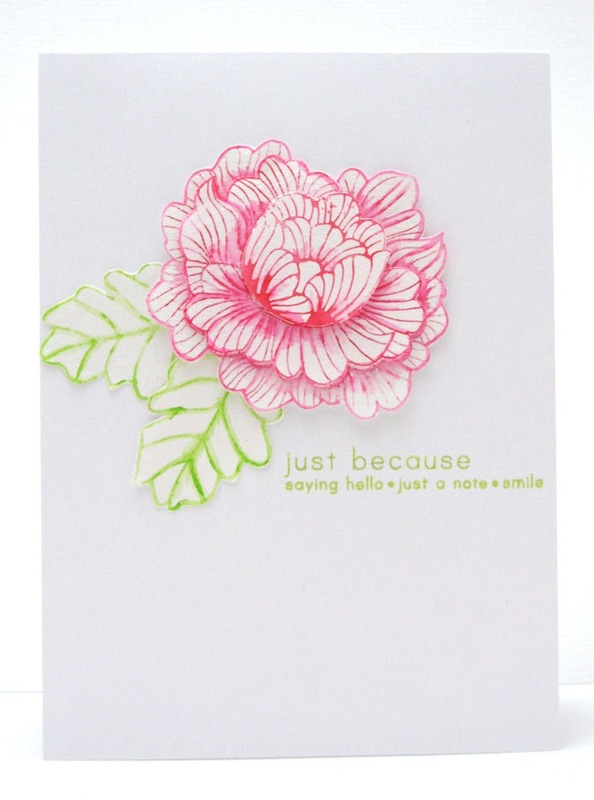 Continuing with flower, below is a card I made using Kuretake water color markers. I colored the stamp with the markers then spray mist it with pearl water mixture, so the flower actually has a nice shimmer to it. Id the same thing to the leaves. Clean and simple. Just the way I like it. Have a blessed day, everyone! Hi everyone and welcome to the first week of June. 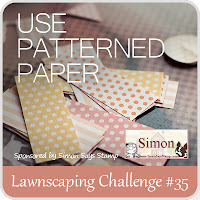 At Lawnscaping we have a new, fun patterned paper challenge for you sponsored by Simon Says Stamp. And, here's my card using Lawn Fawn bright side patterned paper. 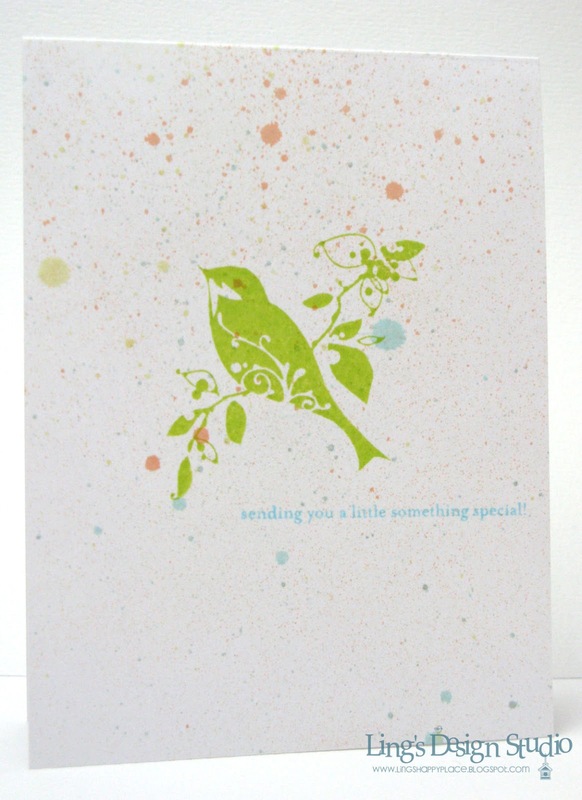 As you can see, I am going through the misting/spatter craze at the moment. 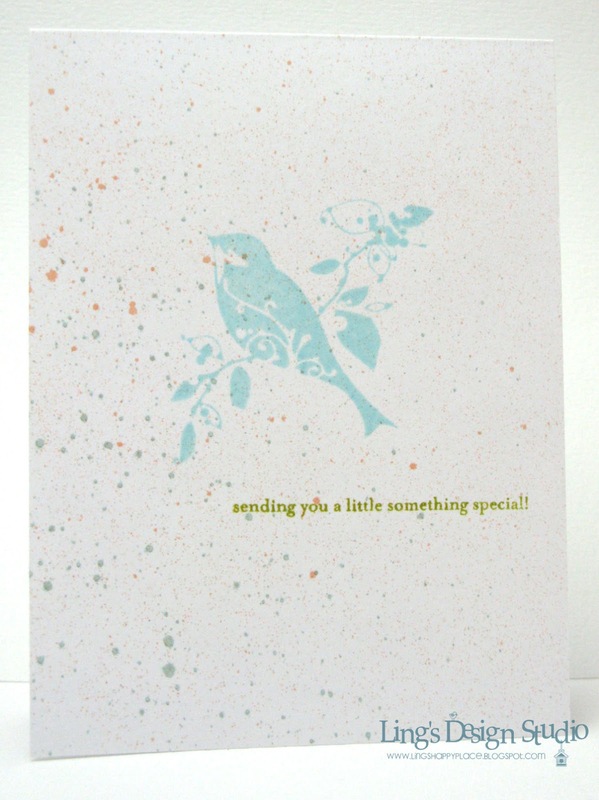 :) For this card, I actually used Tatter Angel glimmer glaze and flick the brush gently to get the spatter. I hope you will play along. 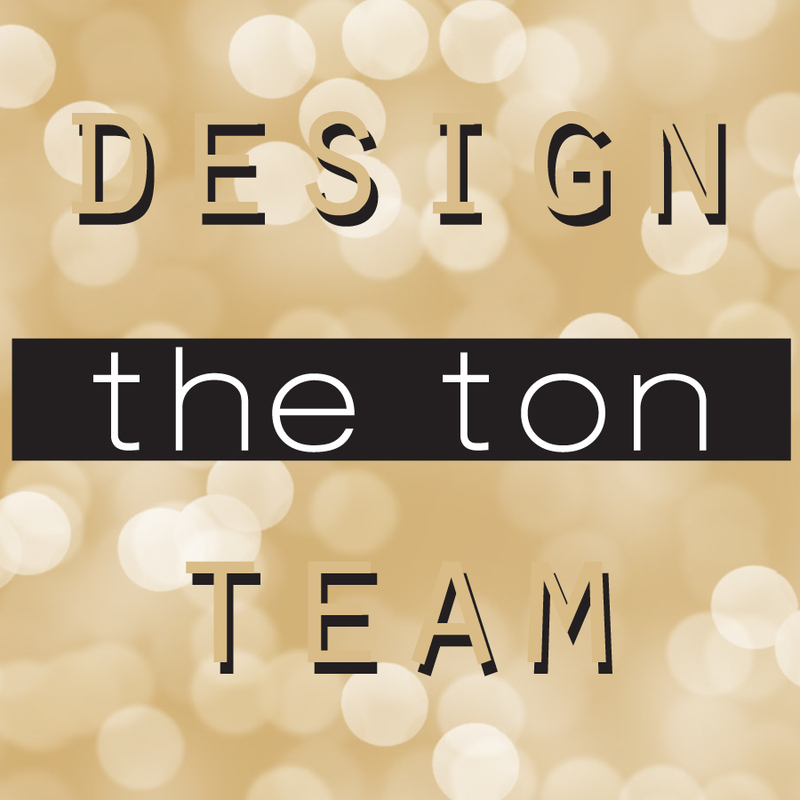 For more inspiration from the DT please check out Lawnscaping blog. 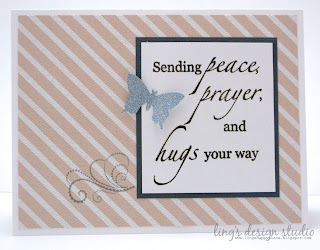 Next, is a couple cards I made for my SIL in Indonesia. She needed some cards and doesn't want to use store bought cards, so here I am happily stepping in. Last week, I made a similar card, HERE. 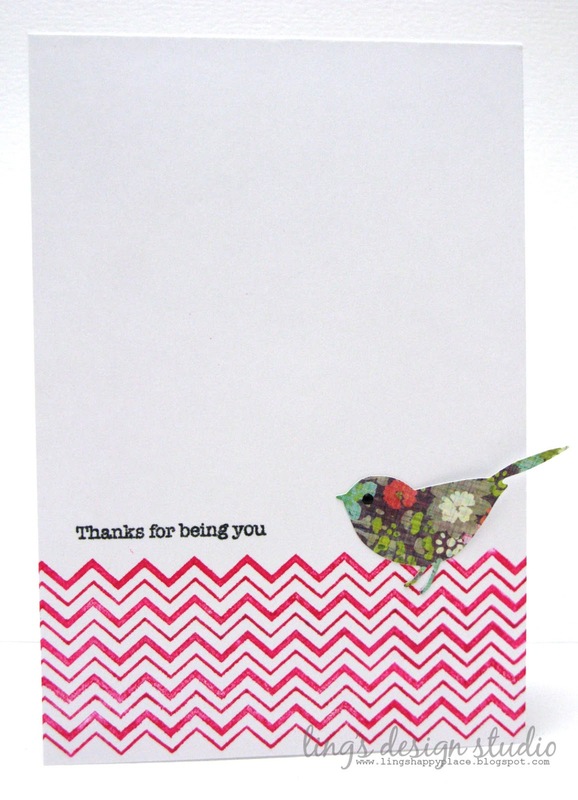 This time I make it totally one layer and using the sentiment from Papertrey Mover & Shaker set. CAS card makes me happy. :) Today is my day at SP & Company blog. You can see my post HERE. Would so appreciate if you could check it out & leave some love. Have a great weekend, everyone. Hi peeps! This is my second post for today. For previous post please scroll down. Happy June (which is my birthday month, so maybe I am a bit partial to this month) and with the beginning of June, it's also the beginning of a new challenge at Some Odd Girl. This time it's a color challenge. Here's a look at the inspiration pic for the colors. Love the vintage look of this pic and love the sentiment even more. I think it's something that we all should aim to be. :) Anyway, here's my card using Under the Sea Mae. 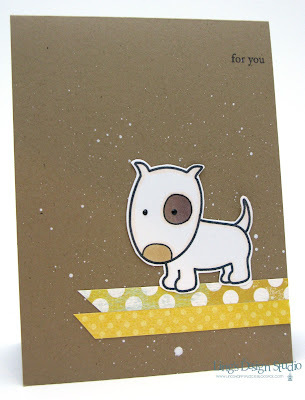 If you have followed my blog for awhile, you know that I love dogs and animal in general. 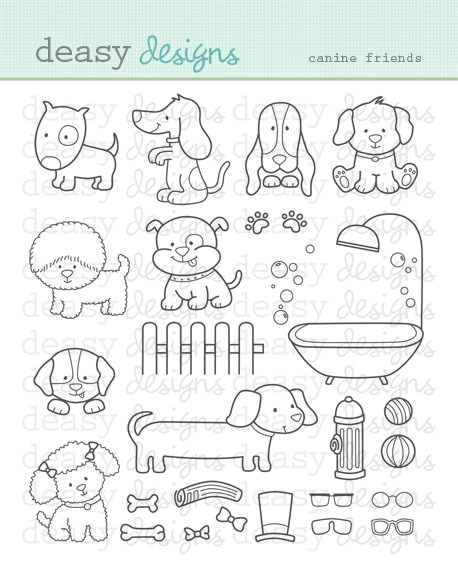 So, when Melania Deasy started her own digi design and asked me to make a a couple cards using her image, I immediately jump in, especially when she, knowing my love for animals, sent me a super cute doggy set called Canine Friends. Here'a a couple of my card using the doggy images. 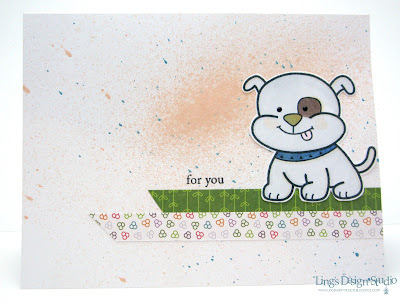 Ack... isn't this li'l bulldog adorable? Love that his tongue is hanging out. :) Next is another cutie. 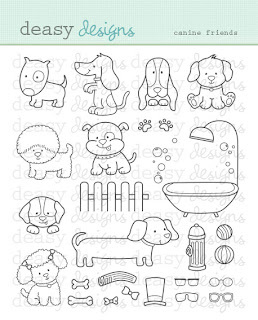 To purchase the set and to find more samples using this adorable set please check out Melania Deasy's blog HERE. 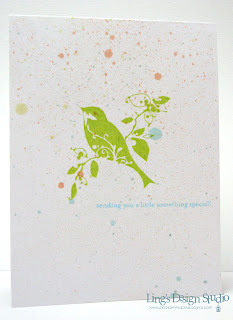 I am entering these cards to Moxie Fab Spatter challenge.